The Curling Line is a visual arts training by the method of Tatiana Valentinovna Krapivina. The method is based on the analysis of an artist's work process, on his intuition, the subconscious and the possibility to create a visible embodiment of an idea. The training includes three steps. Step One. Preparing a hand for art activities (painting and drawing) - drawing arbitrary multicolor lines on a piece of paper. Step Two. Creating a "mood" of the future picture and an “environment” of characters — filling interlinear spaces with two superimposed colors of any of lines, restricting this space, finding a color palette by the mosaic method. If one of the seven primary colors appears while mixing , a third color is added. 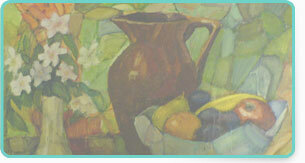 Searching the main characters of the picture, or fitting any picture (still life, landscape, etc) to a mosaic. Finding specific objects of the characters environment. Finishing the work - specification - making details of the characters and their surroundings. The fact, proved by our experience, is that ,while using this technique, a full emancipation of students is achieved, as well as realization of their creativity, imagery and associative thinking. The ability to be independent while working is developed, as copying each other is impossible, even with the same themes. The problems of composition are solved — the so-called sense of "balance on the worksheet» appears. The ability to feel and find proper color relations is developed. Students achieve excellent results, even without primary artistic skills. The author believes that there are no talentless people, there are only uninterested. Working with this method relieves stress, develops the ability to learn, makes unbalanced children and adults more quiet, and also allows to determine the psychological characteristics of a student. The method was presented at the contest "Outsode School Teacher - 92", where it was awarded with a diploma "Contest Finalist" and an icon "Excellence in Public Education." You can see the works, performed by this method, in the gallery section.